Miniature painting developed from the tradition of illuminating manuscripts and originally referred to painting in watercolour on vellum. In England, miniature painting was predominantly a portrait art. It was practised by specialist miniature painters, such as Nicholas Hilliard (1547-1619). In Continental Europe portrait miniature painting had a few great practitioners, such as the French painter Jean Clouet (1516?-1572). But not even Clouet was a specialist; like Hans Holbein, he made both miniatures and full-size oil paintings. This miniature is attributed to Jacques Antoine Arlaud, born in Geneva in 1668, the son of a watchmaker from the Auvergne and the brother of Benjamin Arlaud (1670-1731). 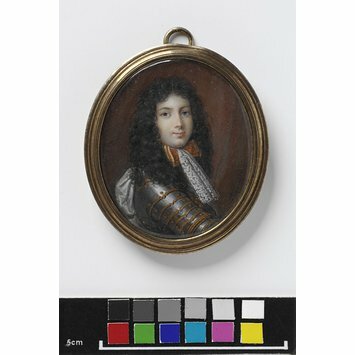 In 1688 he went to Paris, where he became painter to Philippe II, Duc d’Orléans and later regent of France, and it was probably in Paris that this miniature was painted. In 1721 he came to London, where he painted miniatures for the court. He returned to Geneva in 1729, remaining there until his death in 1746. In the early 18th century Rosalba Carriera (1675-1757), a Venetian artist, introduced ivory in place of vellum as a support for miniature painting and the new medium became very fashionable. Arlaud was unusual in continuing to work on vellum. On this example, the vellum is fixed to a copper oval in the French fashion by being folded over and stuck down on the back of the copper. The work is signed ‘Arlaud’ on the background on the right. 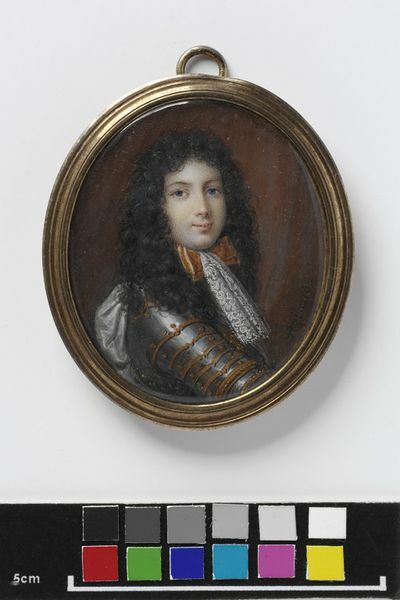 Portrait miniature, watercolour on vellum, formerly thought to be of Philippe Duc D'Anjou (1683-1746), but now reascribed as Philip V of Spain. Portrait miniature by J. A. Arlaud, formerly thought to be of Philippe Duc D'Anjou (1683-1746), but now reascribed to be Philip V of Spain. French School, ca. 1685-1690.